Situated on the fringe of the Fife coastal town of Leven, this recently built executive establishment is within a short travelling dstance of Kirkcaldy, St. Andrews, Dundee and Edinburgh. Leven has a leisure centre, golf courses, beach and nature trail, and lies on the Fife Coastal Path route. 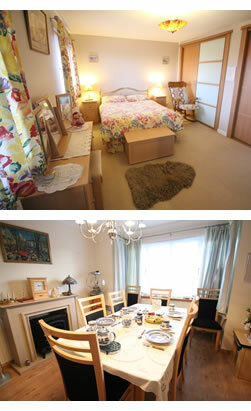 The B & B has 1 double/family room with en suite, and 1 twin room with large family bathroom. There is a large garden where you can relax after a hectic day. Leven is at the start of the East Neuk of Fife and you can drive or take public transport to the little fishing vllages along the coast or to the many tourist attractions in Fife. If you feel enegetic, you can cycle along the recently completed route to Lundin Links, which boasts a link with Lower Largo ( a small harbour village). We ae very convenient for walking the coastal path or shopping in either Kirkcaldy or Glenrothes. Edinburgh and Dundee are a short distance away, so you have plenty of choice. There are ample off-street parking spaces in front of the establishment. We look forward to welcoming you to our home and you can be assured that we will do everything possible to ensure that you enjoy your stay. Please note, we do not accept any pets. Complimentary light refreshments will be available upon your arrival.